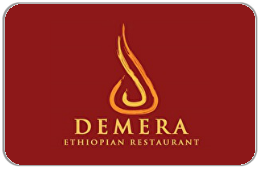 WECOME TO DEMERA Where tradition is served daily, Chicagoland's favorite authentic Ethiopian cuisine. You can enjoy classics like Doro Wat (lemon-marinated chicken stewed in berbere sauce and served with onions, garlic, and ginger. COFFEE LOVER'S ALERT: Demera also roasts its own Ethiopian coffee beans. For balance inquiries call the phone number to a Demera Ethiopian Restaurant's location below.